Born to former slaves in Louisiana in 1867, Sarah Breedlove grew up in a suppressive culture of racism and misogyny. Yet she managed to become one of the first women – not just one of the first African American women, one of the first women – to become a self-made millionaire. How did she do it? She did what many successful women have done since: she solved a problem she had and then packaged, marketed, and sold her products to women just like her. Her childhood did not bode well. Not only was she born in poverty to former slaves – the youngest of 5 children and the first free-born in her family – she was orphaned at the age of 7, married at the age of 14, and widowed with a 2-year-old daughter by the age of 20. In her late 20s, she developed a scalp disorder that caused her to lose much of her hair – and inspired her to devise various home remedies to help cure herself. 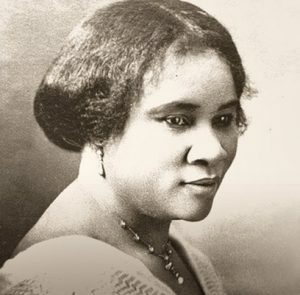 She was hired as a commission agent in 1905 by a successful black hair care product entrepreneur, Annie Turnbo Malone, and moved to Denver, all the while continuing to perfect her own products. Her second husband, Charles J. Walker, worked in advertising and became an important and supportive business partner. He encouraged her to use the name “Madam C.J. Walker” for her products. By 1907, Sarah and Charles were traveling the South demonstrating products and building a strong network of clients in a severely underserved market. The “Walker Method” became wildly successful, and by 1910, the Madam C.J. Walker Manufacturing Company was headquartered in Indianapolis and included factories as well as beauty schools that trained hundreds of sales beauticians. These “Walker Agents” became well-known throughout African American communities. In recognition of her sales agents’ success, she organized clubs and conventions for them, and also supported philanthropic and educational efforts supporting African Americans. Eventually she moved to Harlem and became immersed in its social and political culture. At her death in 1919, she was the sole owner of a $1 million business. She left a third of her personal fortune to her daughter and the rest was donated to various charities. Sarah Breedlove’s astonishing success is a tribute to her resiliency – her inner strength and her ability to build a strong network of friends and family to support her and her business. In turn, she used her fortune and connections to support her employees, customers, and communities, creating a cycle of success for thousands.